Street Volkswagen of Amarillo is one of five dealers in the country to receive the coveted Diamond Pin Award and is one of 20 dealers worldwide to receive this prestigious accolade. 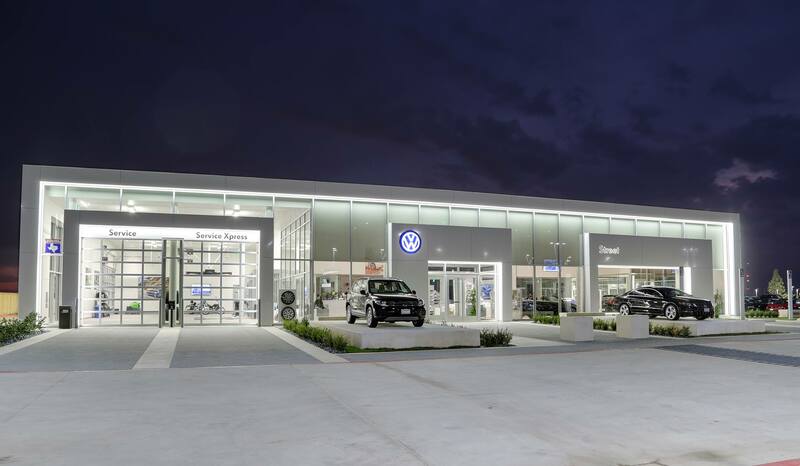 AMARILLO, Texas, October 3, 2018 – Street Volkswagen of Amarillo has been honored with the most coveted award that Volkswagen can bestow on a dealership – the Diamond Pin Award. Street Volkswagen is one of five dealers in the United States to receive this prestigious award and one of 20 worldwide. Each year, winners are hand-selected by the Volkswagen Board in Wolfsburg, Germany. To be eligible for the Diamond Pin, dealers must be nominated by Volkswagen Area and Regional Managers, be thoroughly vetted by the National Volkswagen of America leadership, be a previous recipient of the prestigious Golden Pin Award and maintain the level of excellence befitting the Golden Pin for a minimum of three consecutive years. Street Volkswagen received their first Wolfsburg Crest Club Gold Level Award in 2015 and the Wolfsburg Crest Club Platinum Level Award in 2016 and 2017. Street Volkswagen also received the Customer First Club Award in 2016 and 2017. In 2017, Street Volkswagen was honored with the Gold Pin Award from Volkswagen. It is an honor and we are humbled that Street Volkswagen has received this enormous award and recognition. We'd like to thank Amarillo and the Panhandle community for making this possible and we will forever continue to live up to these standards that Volkswagen holds for its honorees. The Golden Pin and the Diamond Pin Awards are based upon numerous qualifications in Sales excellence, Service and Parts Department excellence and Community Service in their market. To ensure the dealership is a stable and viable representative partner of Volkswagen AG and VWoA they must pass random facility inspections, pass random administrative audits and random financial audits. After these random inspections and audits, the dealership’s community impact was closely examined and Street Volkswagen proved to embody this significant qualification. General Manager and Managing Partner John Luciano and his wife Kat Luciano will attend the “Commendation Day” ceremonies with VWoA Delegation Representative Derrick Hatami and members of the NAR Executive Management team in Wolfsburg and Berlin, Germany, from Dec. 6-9, 2018. While in Germany, John will be pinned with the Diamond Pin Award. Employees of Street Volkswagen will be honored with a celebratory dinner in November for their hard work and success. Earlier this summer, the Amarillo Chamber of Commerce named Street Volkswagen of Amarillo one of Amarillo’s Top Business Award recipients. This marks the second time the company has won this award. For more information about Street Volkswagen of Amarillo, visit the dealership at 8707 Pilgrim Drive in Amarillo, Texas. To chat with a live representative, visit www.streetvw.com or call the dealership at 806-350-8999 to speak with someone directly. Street Volkswagen of Amarillo opened in Amarillo, Texas, in 2013 and has since been a valuable corporate citizen in the Texas Panhandle. They provide support to area nonprofit organizations such as Boy Scouts of America, United Way, The Mavericks Boys and Girls Club, Young Life, High Plains Food Bank, Eveline Rivers Christmas Project, Snack Pak 4 Kids, Amarillo Symphony, Amarillo Museum of Art, Discovery Center, CACHA (Hispanic Chamber of Commerce), West Texas A&M University and many other organizations.